Decolor B Shimmer Intro Kit 4 pc. 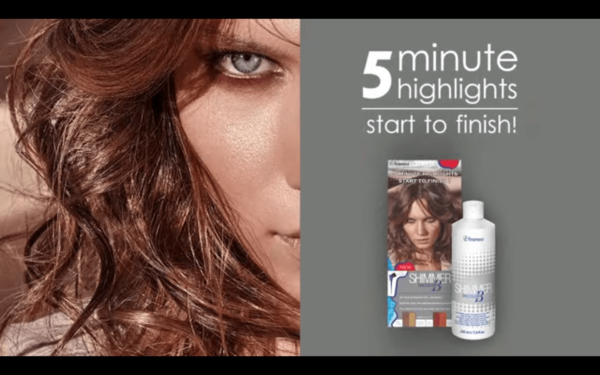 5 Minutes Highlights – Start to Finish framesi Shimmer Decolor B can lift up to 2 levels on tone is flat iron activated and great for use on natural or colored hair. 1. While wearing gloves, pour 10 ml of SHIMMER liquid into a bowl. 2. Weave / separate a section to prepare for SHIMMER service. 3. Prepare to apply SHIMMER with the applicator tool provided. Dip the applicator tool in the liquid and remove excess product by pressing applicator tool against the edge of the bowl, being careful the liquid does not drip from the applicator tool. 4. Use a paper towel to remove (dab) excess from applicator tool. 5. Use applicator tool to paint on SHIMMER liquid lightly, staying a half-inch from the scalp, no need to over – saturate (do not apply to scalp), then comb. 6. 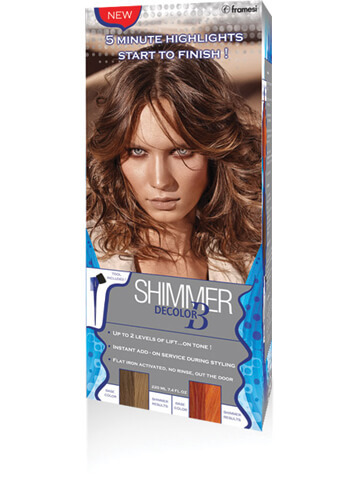 Activate SHIMMER with a flat iron (set to 350˚F – 375˚F, maximum, 170˚C -190˚C, maximum). 7. Flat iron the SHIMMER treated section of hair with fast, uniform movements, without stopping…CONTINUOUS PASSES…until the hair is completely dry. 8. Do not rinse the hair. 9. For additional lightening, repeat the application instructions a second time of the same section of hair. Recommended not to exceed two applications per section of hair. 10. Do not put the leftover product back into the bottle when the service is over. Aqua (Water), Hydrogen Peroxide, Panthenol, Polyquaternium-55, Polyquaternium-22, Cetrimonium Chloride, Etidronic Acid, Silicone Quaternium-22, PPG-3 Myristyl Ether, Phenoxyethanol, Caprylyl Glycol. The 5 Minute Money Maker Exclusively by framesi Decolor B SHIMMER.